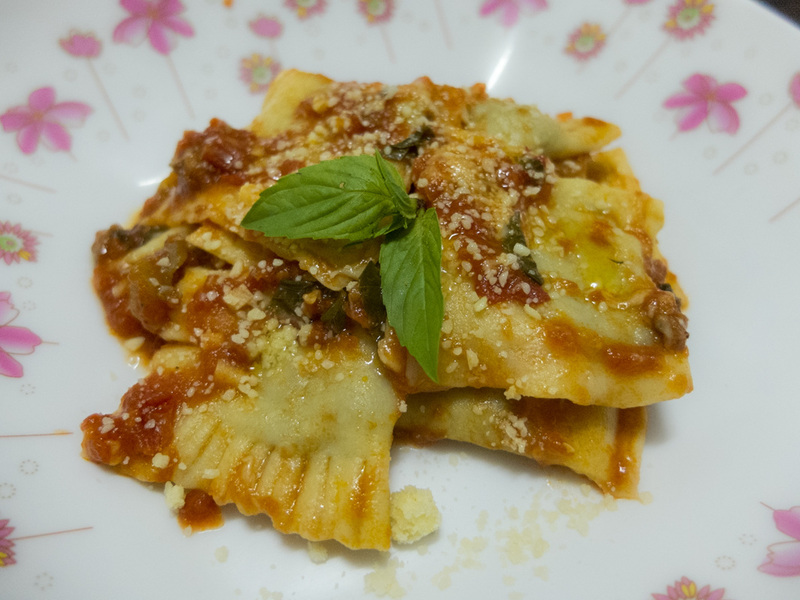 I invented this recipe during our stay in Ao Nang, Southern Thailand, as I was challenged by our hosts’ request there to make ravioli with mozzarella. So I thought of a combination for guaranteed success, aubergine and basil, and given the common affection for the meat Italians and Thai share, I decided to add a bit of minced pork. Garlic gives an extra notch to the tasty filling, but be careful not to overdo it. As a condiment to my experimental ravioli, I chose a simple tomato sauce with basil. The experiment was very successful! Firstly, peal the aubergine and cut it into 1cm thick slices. Distribute the slices evenly on a cutting board and sprinkle them with rock salt. Let stand for about twenty minutes, or until the aubergine releases excess water, then rinse thoroughly, pat dry with cloth and dice into cubes. Once this step is over and done with, we can move on to the ravioli filling. Heat a little bit of olive oil in a sauce pan and add the finely chopped garlic. Cook for 1 minute and add the minced meat. Use a fork to break up any lumps and let cook, adding freshly ground black pepper. Simmer with half a glass of red wine until reduced, and then add the diced aubergine. Add salt to taste and simmer on low heat until the aubergine is cooked. At the very end, add a handful of fresh basil, turn off the heat and leave to cool down. Meanwhile, cut the mozzarella into cubes and put it in a colander to drain the milk. Only when the aubergine and sausage mix has cooled down, add the mozzarella, previously drained with your hands. At this point, with your filling all ready, you can start making the ravioli. For the condiment, since the filling is very tasty and flavorful itself, make a simple tomato sauce with plenty of garlic and fresh basil. Once cooked in boiling salted water, drain your ravioli and add them to the sauce. Turn the heat on low and stir gently adding a sprinkling of freshly grated parmesan cheese.